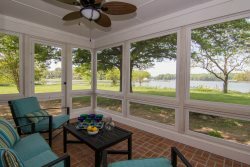 This was an amazing house (with a really cool screened porch and a private dock!) in a wonderfully serene setting. We had all the amenities we needed and more! Really couldn't have asked for anything better and would highly recommend it to anyone looking for a relaxing, comfortable stay! What a great trip and stay! The pictures definitely dont do Thornton justice! The house is perfect for a large group and the landscape is stunning. Our group had never been to Chestertown, but the owners were a fantastic resource for local attractions and places to go/see (big thank you to Lisa for answering all of our questions and for all of the great recommendations). For us the combination of the houses privacy, the activities to do on site and having quaint downtown Chestertown just a short drive away made our trip to Thornton a fun yet relaxing getaway. Well definitely be back! We loved staying at the Dinghy. It is a very spacious well appointed home in a beautiful location. Only tiny, tiny thing missing was a pitcher to make lemonade otherwise everything was there and we enjoyed the entire weekend!